32 S&W ammo was introduced in 1878 for the Smith and Wesson 1 and ½ Model revolver. The 32 S&W gained the "short" title after the 32 S&W Long was introduced. The 32 S&W short rounds were designed for short distance self-defense, in a revolver designed for concealment in a vest or a front pocket. 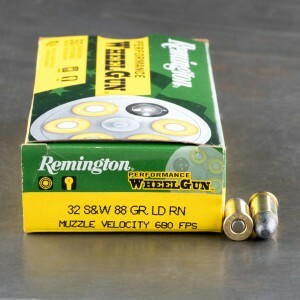 The small round was not know for either it’s exceptional accuracy or it’s stopping power, it did give people a small and easy to carry weapon for self-defense in a dangerous time when a full sized six shooter was not an option. The 32 S&W is still a popular round among enthusiasts of small antique revolvers. The 32 S&W can also be fired in revolver chambered in 32 S&W long. 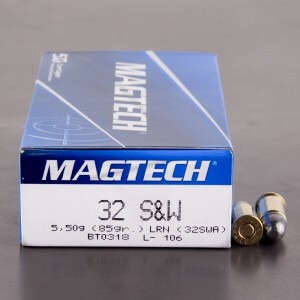 Look for 32 S&W ammo for sale here at AmmoToGo.com from well-respected manufacturers located in the United States and all over the world. They work great. I use them in an Sass competition pocket pistol.